He travelled to all the distant parts of Russian Empire. This is for example a dweller of Turkmenia, now Turkmenistan. 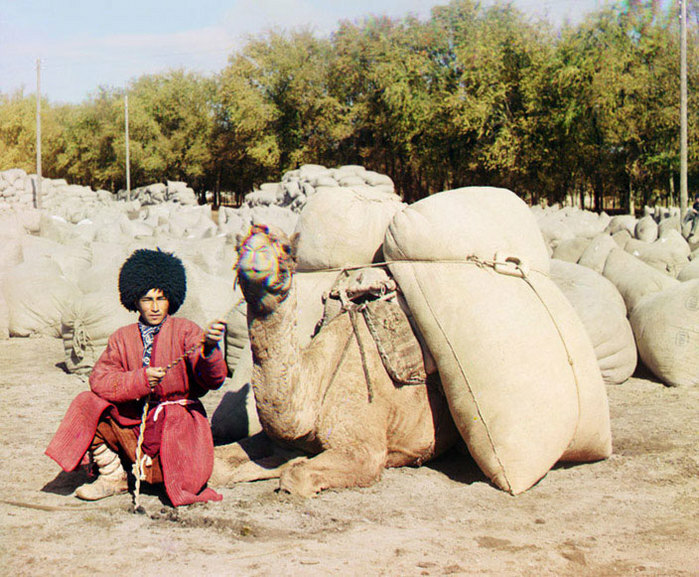 Camels were the common way of transportation for cargo even when trains were introduced to locals by Russian government. 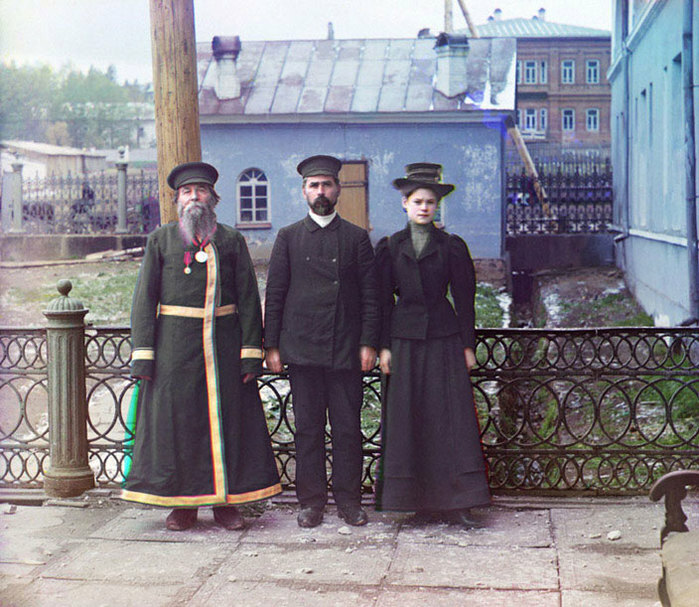 We had already before some photos of this photographer, who managed to make color photos of Russia 100 years ago in 1900-1910. It’s amazing to see the life back there in full color. 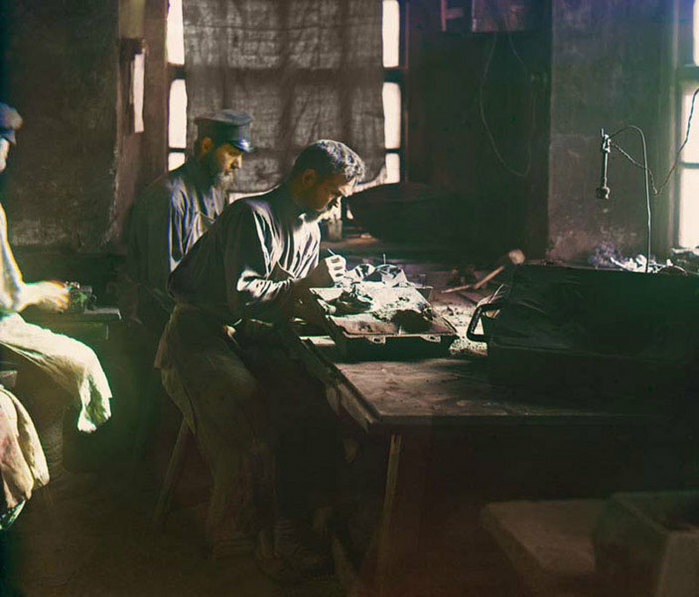 He had a special task to travel across all the Russian Empire (that’s how Russia was called that times before Communism) and make thousands of such photos for a Royal Depositary. 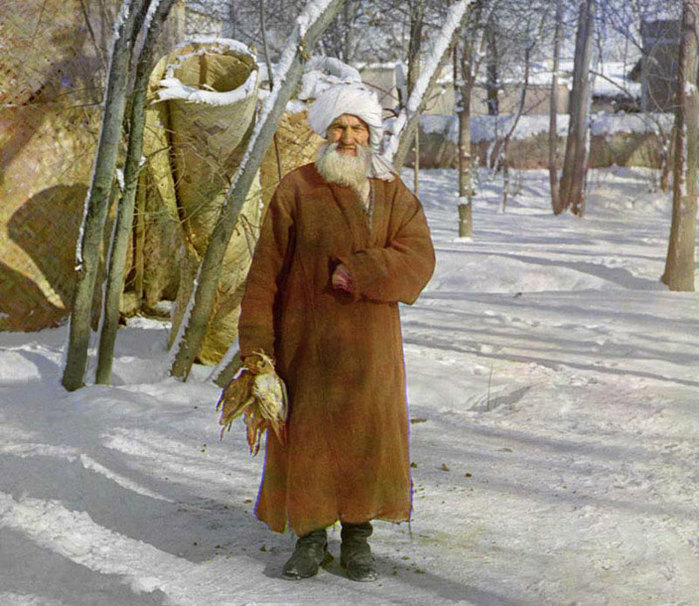 So he made literary thousands of color photos of Russia 100 years ago. These are owners of Military Factory on Ural, region close to Siberia. 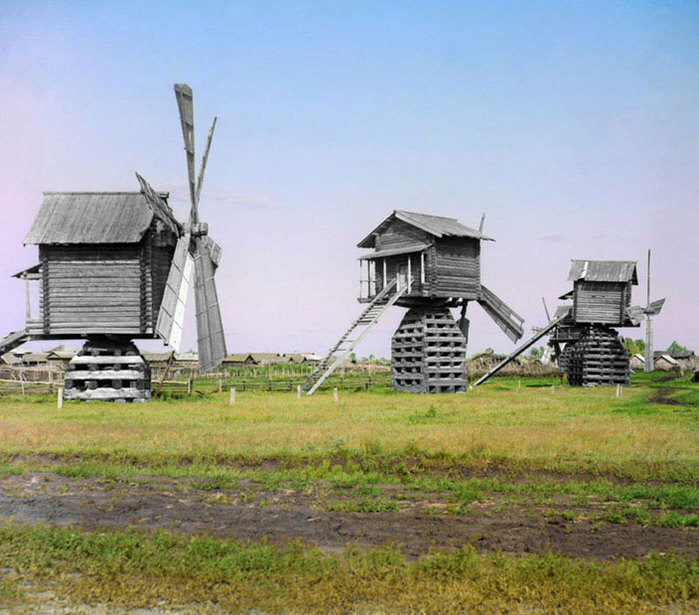 Mill-houses made of unpainted wood, which became gray after many rains. That’s a middle of the summer in Siberia. 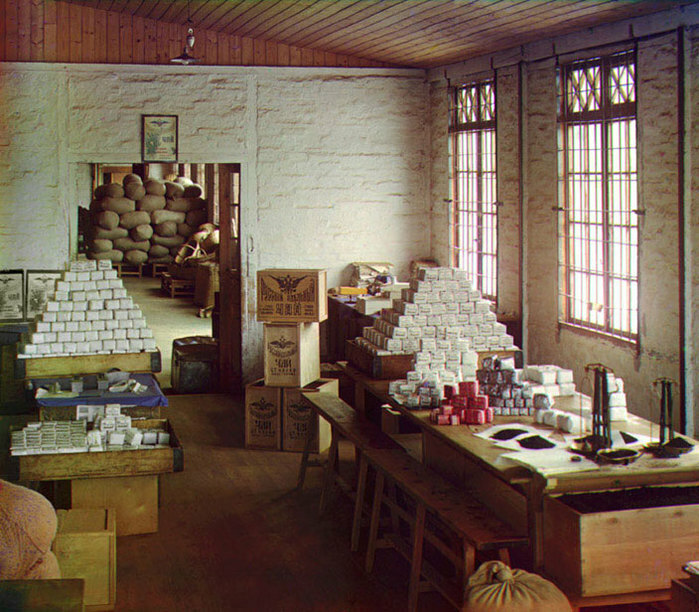 That’s a first tea manufacturing factory located near the Batumi, nowadays Georgia, on the shore of the Black Sea. It was the major supplier of tea to all the Russian Empire. 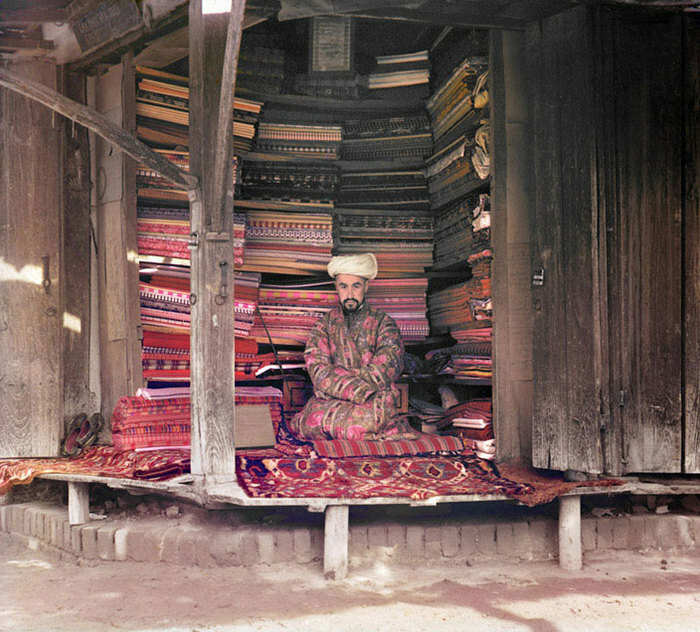 This is a market in Samarkand, he sells silk and wool fabrics together with some traditional middle east carpets. On the top of his trading place one can see a page from Koran in the frame. 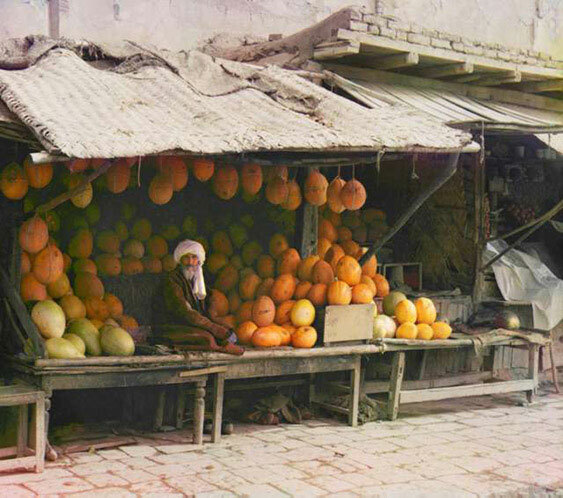 That’s another seller from the same marketplace in Samarkand, he sells melons. He wears traditional cloths. Samarkand was part of Russia at that time. That’s a steel factory, founded in 1747 between Ekaterinburg and Chelyabinsk cities, in Ural, close to Siberia, in the region rich with steel ore.
At the moment when the photo was made there were working more than 3,000 people at this factory. And this is steel ore mining. This particular mine was a family owned business, one of many other suppliers of steel ore to that factory above. Literary all the family was involved in extracting of the ore. 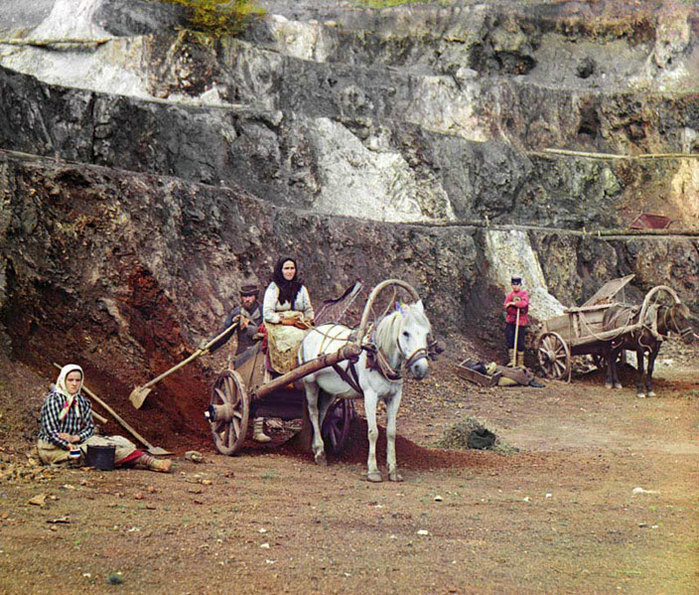 This is a fall of 1909, depicts the peasants who are on the break from the crop collecting job. 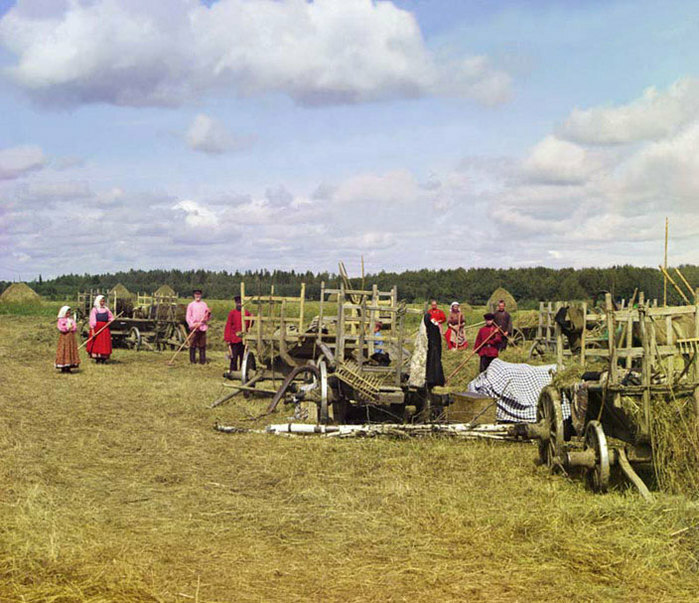 The photo is made near Cherepovec, a city which lies North from Moscow. 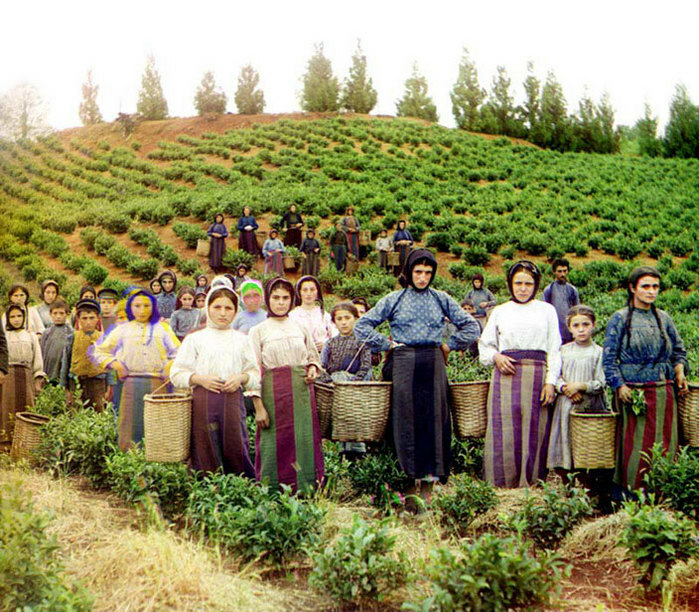 Those are Greek migrants from Greece working at tea collection, on the east shore of the Black Sea. In this region of Russia there was a big group of people from Greece. The most warm regions of Russian Empire at that time were on the shores of the Black Sea, thanks to the mild climate in those regions some Southern sorts of plants, like tea or cotton, could be grown there. That is the old man of Samarkand holds some birds he just has caught. From time to time we would post more of this outstanding photographer together with descriptive comments. Just wanted to tell you that your blog is fantastic. You know what I´m talking about: FAN TAS TIC! If they move, the photos will have a odd color shadow around them. You can see this effect on the animals and on the a few of the people. This is a very difficult method of photographing live subjects, and it makes me wonder how many tries each of these photos took before we got the ones we see. 1st and last and similar pictures – they are not russians. these are really fantastic! Thanks! Now this is more like what English Russia should post up. Kudos. Nice! Those were really great. I love this site so much. Seeing all of the pictures and stories from this point of view is really amazing in comparison to America’s. It makes me hate m country’s people more and more every day. Keep up the spectacular work my friend. These are amazing and wonderful photos. They really make the past come alive. Remarkable. Thank you. Thank you. The pics are incredible. I seen that photos in the Russian Museum in Saint-Petersburg in 2003. Really perfect. It is pity, that you’re not represented all the photos here. Excellent job! It was like having an opportunity to peek in to past centuries. great choice of fotos and a very interesting post! thanks!!! excellent pictures. would love to see more! Excellent pictures. Much more of this please, especially from across the whole of Russia. There’s more to Russia than Moscow and cars. Please show the wide spread of the different people. It would be hard to post them all here. 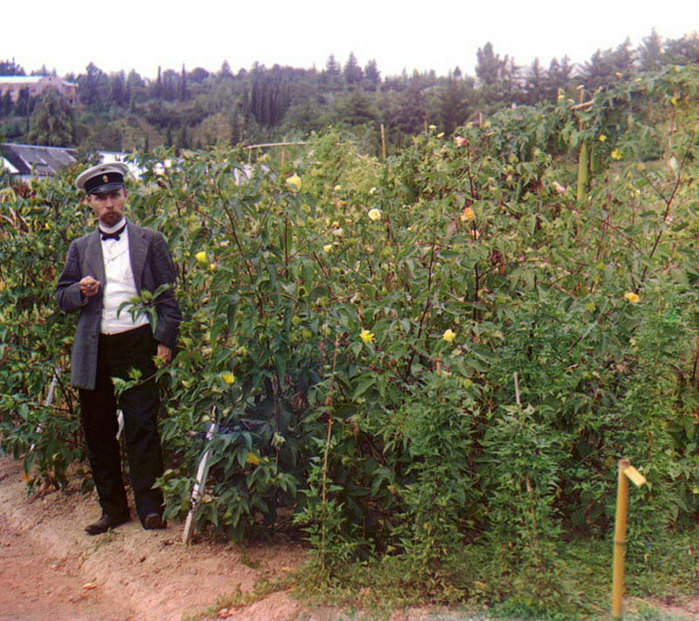 Prokudin-Gorsky made hundreds of those. And Delicious (post 4), thank you for your interesting comment. I agree with “a fan”. I love *cough* ancient Russian culture and heritage, probably stemming from the great novels from that time. Photography in this way I can never get enough of. Kudos to the maker and more of it! i read all the comments made, and like to share my feeling with all the ones who wrote their comments and praised the work done by a very special artist. the work is beautiful, keep it up and like to see more of it. Awesome blog post, thanks for keeping me busy! Saludos desde México, Yo conozco su sitio, por Marina Lapishka, en twitter es @marisk_ ella me mostró su sitio, es fantastico. Greetings from Mexico. I arrived to your website because an Ekaterimbug friend Marina Lapishka -aka @marisk_ in twitter- she show me this fantastic place, and i will spread in my site, your bautiful place!!!! ya… coool… but its not clear…..
and Russia has its own culture … but thats not shone here..